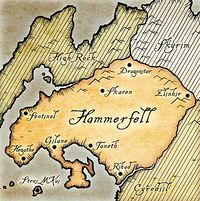 Rihad is one of the eight-major kingdoms in the province of Hammerfell, being situated along the southeast coast along the Abecean Sea. Rihad is found along the eastern coast along the Abecean Sea and the Brena River. The latter makes up the westernmost borders between Hammerfell and nearby Cyrodiil. Rihad is found in southern Hammerfell, which is generally considered territory of the Forebears. Southern cities like Rihad are considered more cosmopolitan. The land around Rihad, and the Gold Coast of Cyrodiil is considered wet-drylands. Forest fires are common in this area throughout the summer. Because of the city's proximity to Colovia, the western Imperials have a vast impact on Rihad's culture. Some Redguards would go naked in the streets. Sometimes these individuals would roll in the dirt and nip people by the leg, as if they were slithering Snakes. The land just south of Rihad, throughout the Brena River is filled with River Trolls. The Dervishes of Rihad, religious figures were known for being talented sword-masters. Outside of the city-state is the ruins of Stonekeep, which once served as the home of a knightly order. Rihad is neighbored by several settlements, including Chaseguard in the northwest, and Stonemoor in the northeast. Rihad's founding is largely unknown. The southern coast and the Abecean Sea were explored by the Tavan wave, the second wave of the Ra Gada. The Redguards that resided in this portion of Hammerfell are the Forebears. The Red Dervish of Rihad, Yousebh the Stringent was famously quoted for the phrase, "A daughter of the House of Akos Kasaz shall not marry an infidel of another house." What this means is that a daughter of the Crowns shall not marry another Redguard that drifted away from the Yokudan customs, like the Forebears. During the time of the Akaviri Potentate in the early Second Era, the city-state of Rihad was ruled by the Crown Grandee Murahd of Rihad. Murahd is known for being the father of Queen Arlimahera, a former High Queen of Hammerfell that attempted to conquer the region of Bangkorai. During her travels across mainland Tamriel, Princess Ayrenn of the Summerset Isles had traveled to Rihad where she was able to defeat the Dervishes of Rihad in their style of sword-dancing. By 2E 578, the city-state of Rihad was a part of the Daggerfall Covenant. Amidst the Tiber Wars in 2E 862, there was a conflict called the War of Rihad. The Colovians were involved in the war, and for a brief time, they used Wood Elf archers. This proved to be a failure as they were undisciplined and likely to desert from the conflict. The Wood Elves would sometimes walk into the shade of a tree and vanish. In 3E 20, the Redguard historian and translator, Destri Melarg was born in Rihad. He would study at the Imperial City, being one of the first Redguards at the time to visit the Imperial Province. In 3E 253, Haymon Camoran had raised an army and attempted to conquer western Tamriel in what would become the Camoran Usurper's Invasion. The city-states of Rihad and Taneth were besieged at the Battle of Dragontooth within two weeks. In this conflict, the Crowns city of Elinhir did not attempt to help the Forebears in the south. During the Imperial Simulacrum in the late Third Era, the city-state of Rihad was an active settlement, being ruled by Queen Blubamka. It had a rivalry with Taneth. After Jagar Tharn had assumed control of the Empire, the spirit of Ria Silmane was able to guide the future Eternal Champion out of the Imperial City Prison to begin their quest to assemble the Staff of Chaos. Silmane had guided the Champion to find the first piece at Fang Lair. Their journey took them to the city-state of Rihad and the audience of Queen Blubamka. The Queen would offer the location of Fang Lair if they acquired a parchment from Stonekeep. When the parchment was returned, Blubamka had shown the way to Fang Lair, where the Champion claimed the first piece of the staff. ^ A Betrayal of Our Heritage — "Nworc at-Traeh"
This page was last modified on 13 February 2019, at 03:43.